BYOD has done a lot of what it was supposed to do, in that it has transformed classrooms at some schools in the country into a digital learning hub. It has done this well when two factors are in place. The first is that the students’ families must be able to afford the technology and the second is that the teacher must know how to use it. A mother of a high school aged student told School News that a conversation with a teacher at the state high school where her child attends had raised an interesting problem. It had come to her attention that students were using smartphones in class. It emerged that they were not required to keep them out-of-sight-never-to-be-touched as she had imagined, but were encouraged to use them to look things up, to watch educational clips and other web-based activities. The mother says the explanation offered was the divergence between what the department strongly encourages – and by extension – their school principal, and the actual available technology at the coalface. Teachers are being told to employ digital technologies to teach curriculum. Experts issue a barrage of terms like ‘digital literacy’, ‘digital natives’ and ‘21st century learning’. “Teachers have to move with the times and use technology to enhance learning,” they say. Yet, in many classes less than 20 percent of the students have families who have been able or willing to purchase the BYOD equipment. This leaves the teacher in a tight spot: do they revert to pen and paper and dust off the old projector, or do they accept that students actually do have technology – cheap smartphones, with wifi connectivity and access to the world wide web. The latter option was taken by the school in question and the by-product of this was a whole other behaviour management challenge of monitoring device use. When a personal device cannot be kept distinct from the ‘school computer’, those pesky grey areas of ill-defined boundaries emerge. These are exactly the sort of vagaries teenagers are keenly adapted to exploit, and exploit them they will. Whether you choose to keep tech out of your lessons; cater to the many who have no BYO device; or cater to the few and use tech in your lessons, but ask them to share, and supplement the viewing with a central monitor – the system is by no means seamless. The tech revolution is at that awkward stage where planning and theory are ahead of the operators on the ground, and until more government assistance is offered to families to uptake the BYOD programs, progress will probably continue to stagnate. As always, teachers are a resourceful breed and perhaps, using smartphones is just a practical way to get students accessing the internet. Until the government supplies laptops for students, teachers will continue to juggle and every school will develop their own approach to the tech dilemma. Schools have responded to the challenge in ways as diverse as the socio-economic composition of their communities. 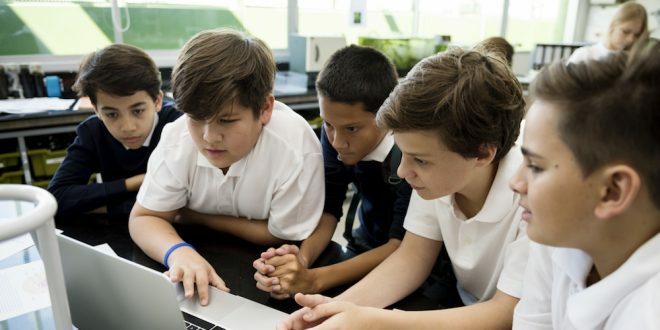 One method, often employed by independent schools, is to implement a one-to-one laptop program, where a fee is charged and a deal is cut with a supplier for bulk lease rates. The computers are leased to the school and the machines can be clearly earmarked for school work and formatted to exclude unsanctioned activities. The fee can be anything from $1000 to 2000 for the duration of enrolment to inclusion in a tech levy that could total upwards of $1000 to $2000 for a single school year – a cost prohibitive to a vast number of Australian families. Another option is to establish a relationship with a supplier that allows families to pay a lease fee in regular instalments. While this will be out of reach for many families, equity machines can be negotiated into the deal for eligible families. While schools will generally not purchase a device to assign to a student nor make a device permanently available for a student, most public schools will have some provision for student access to computers, if and when they are conducting educational programs that necessitate their use. How you arranged your equity program will depend on the resources of the school and the number of students who will be eligible for assistance. Schools can provide students with the loan of a laptop or other device for a particular period or class, or for the duration of a unit of study where it’s required. As with most new initiatives, schools will form their own approach to the problem and meet their students’ needs as best they can. Back in 2013, teacher, consultant, speaker and blogger, Dan Haesler, wrote an article for the Sydney Morning Herald titled: ‘Bring your own: how modern-day schools are trying to cope’. He said the NSW government had issued a recommendation that schools set up cake stalls to fund BYOD programs – that’s a lot of chocolate crackles. Their other suggestion was to ”set your school up as a charity”. He added that this might sound like a smart move, but considering charities can’t be entities also owned by the government, the solution excludes those who need it most: public schools. As the murmur from futurists intensifies to a deafening roar that technology must underpin this generation’s education, solutions simply must be found. Perhaps donations are not such a bad idea – or some form of sponsorship, just to ensure our students are accessing the technology they will require for those future professions we are constantly reminded ‘have not been invented yet’. However, as Haesler lamented, “decisions affecting the education of our children are being driven by economic factors beyond pedagogical considerations”. “I’m a fan of BYOD, but the government must ensure two things: that funding is available to ensure teachers are fully equipped with the skills and know-how to implement it properly; and funding is in place so that our hardest-to-reach children do not have to rely on cupcake sales to keep up,” Haesler concluded.